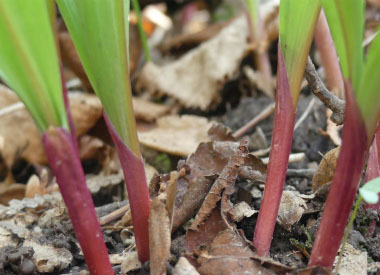 Wild leeks, (also known as ramps or ramsons), are one of the earliest wild edible plants to emerge in spring. 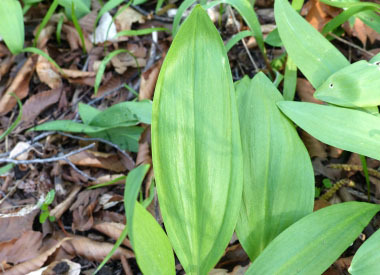 Historically ramps were regarded as a spring tonic and early settlers relied on their restorative qualities after a long winter. Wild leeks are in the onion family (Alliaceae) and the scientific name means onion or garlic (Allium) and three seeded (tricoccum). There are actually two varieties. Var. tricoccum has broader leaves, commonly reddish at the base and up to 50 flowers in a cluster. Var. burdickii has narrower leaves, green at the base and is shorter stalked, with 20 or fewer flowers per cluster. Distinguishing Features: Wild Leeks are onion-like plants that grow in the woods. The smooth, elliptical-shaped leaves come up in the spring, making them very easy to spot in a forest. They are easily distinguished due to their scent; both the leaves and bulbs smell like onions. If unsure, crushing a leaf will tell you if it is a leek or not by the onion-scent. Flowers: Flowers appear 4 to 6 weeks after leaves have emerged, usually after they have withered away for the season. White flowers have six tepals (petals), six stamens with creamy yellow tips, and a green ovary with three globular sections in the center. Fields of Nutrition has medicinal benefits and vitamin/mineral content of Wild Leek. 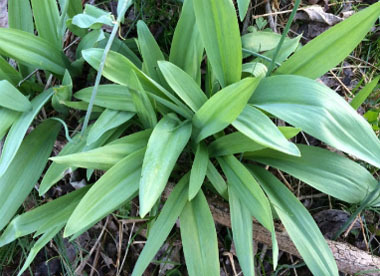 Leaves: Wild leeks have two or three basal leaves emerge from an underground bulb in early spring, and they grow 15 to 30 cm (6 to 12”) long, and 2 to 10 cm (1 to 4”) wide. They are lance-elliptic, narrowed at both ends with a long tapered base. Leaves have a smooth leathery texture with faint parallel veins, toothless, dark green often tinged red at the base with a reddish stalk. 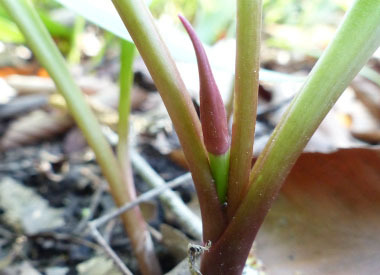 Height: Ramps grow from 30 to 45 cm (11-17”). 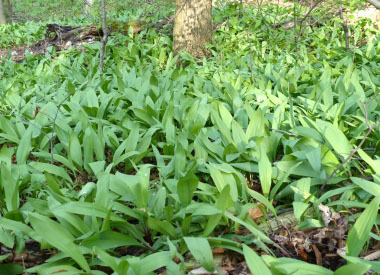 Habitat: Wild leeks (or ramps) typically grow in forests in which there is some sunlight. They mostly occur on the eastern half of the United States and Canada. Both varieties (Var. tricoccum and Var. 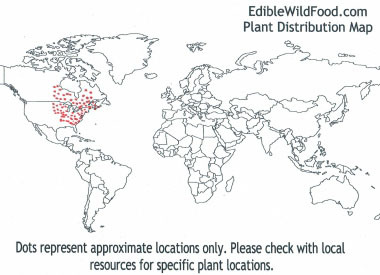 burdickii) grow in the same geographical areas as shown on the distribution map (on image carousel). 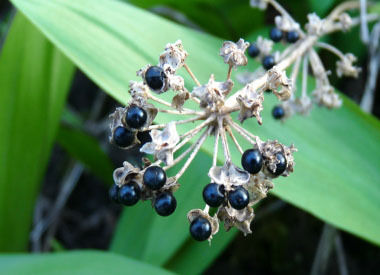 Edible parts: The leaves and bulbs are edible raw or cooked. Depending on the geographic area you are foraging in, it is highly recommended to only harvest one leaf per plant due to the 7-year growth cycle. Please refer to: How to Take a Leek in the Woods.